Dr. Joanna Bailey stands outside of the Tug River Health Association in Gary. Bailey is especially concerned about the effects of unclean water, and fear of it, can have on her patients throughout Southern West Virginia. “Part of what she included on the list of things that she had to buy, and I quote -- that I remember from 6 years old -- ‘a Mountain Dew to brush my teeth,’ ” Bailey said. Bailey now works as a family doctor in two southern West Virginia counties. More than 25 years later, she still sees distrust of the water as a near-daily part of her practice. She sees up to 100 patients a week at the Tug River Health Association clinics in Pineville, Wyoming County, and Gary, McDowell County. Residents’ concerns about their water arise regularly, especially when Bailey asks whether kids are getting enough fluoride. “Often they’ll say, ‘Oh, we can’t drink our tap water,’ or ‘We don’t have city water’ or ‘I don’t trust the tap water,’” she said. That wariness alone can create health problems. Charleston Area Medical Center researchers trying to increase youth water consumption at West Virginia schools found during research conducted earlier this year that simply having access to clean, free drinking water can help get kids to drink more of it, which may reduce obesity. The state has the highest adult obesity rate in the nation and the second-highest for kids ages 10 to 17. Bailey worries that families simply don’t consider water to be a staple of their diets. She’s in the early stages of a research project to examine if water concerns drive people to buy sugary drinks that can lead to health problems. Although it’s difficult to attribute health complications specifically to water quality, or to separate them from other factors like air quality, lifestyle habits and diet, many residents have found ways to work around fears they hold about their water. In Southern West Virginia, some families load up their vehicle every week with empty jugs or barrels and drive to one of a handful of fresh mountain springs to stock up on water. Residents seeking such springs already know where they are. Their families have filled up there for years. One spring in the small community of Marianna, in Wyoming County, is on Alpha Natural Resources mine property. To get there, visitors must get a nod from the guard station and drive over potholes on a one-lane gravel road, which is on a cliff over the Guyandotte River below. A sign at the entrance warns visitors that filling up is prohibited after dark, but during the day, water flows out of the mountain in several spots. A long black hose is propped up on a cinder block, and what comes out is cool and clear. On a recent visit, a jug of laundry detergent sat nearby. “A lot of people use it for household use,” said Nicholas Fortner, who runs a convenience store in nearby Brenton. But some fret over the untested mountain springs, and what the water might pass through before it ever makes it out of the pipe. “I think with city water, it’s the devil that you know,” Bailey said. “They’re required to test that water, they’re required to know what’s in it, they’re required to tell you what’s in it. Nobody is testing the water that’s running out of the mine in Marianna. Similar springs are dotted throughout Southern West Virginia: There’s one on U.S. 119, near the Logan/Mingo county line, and another in Maybeury, McDowell County. People talk about springs in Gilbert, Coalwood, Keystone and a handful of other locations. Apart from her work at Tug River Health Association, Dr. Joanna Bailey is involved in a crusade to get decent drinking water for her family and neighbors, and if successful, those efforts could lend credence to concerns that water can make people sick. Bailey and her husband, David, and their neighbor, Sherman Taylor, sued their city water provider, Pineville Municipal Water, in June. They claim pollutants in the water gave Taylor kidney cancer and put the Baileys and their son at risk of health problems. Pineville Municipal Water officials deny the allegations. But the beleaguered water system failed to comply with state reporting standards last year. In a letter to customers, Pineville Municipal Water said that test results showed its water had elevated levels of certain chemical compounds that form during the treatment process -- but that there was no immediate risk. People who drink water with such levels “over many years” may have “an increased risk of getting cancer,” according to the letter. The case is scheduled for trial in 2020, and Bailey’s attorney, Adam Taylor said he’s seeking class-action status. It hits close to home for him too: His father is Sherman Taylor. The suit seeks damages for Taylor but also asks the water company to set up a “medical monitoring” fund. “[Customers] would be able to go get check-ups and get screened for the types of cancer this water might have caused and not be financially impacted by it,” the attorney said. 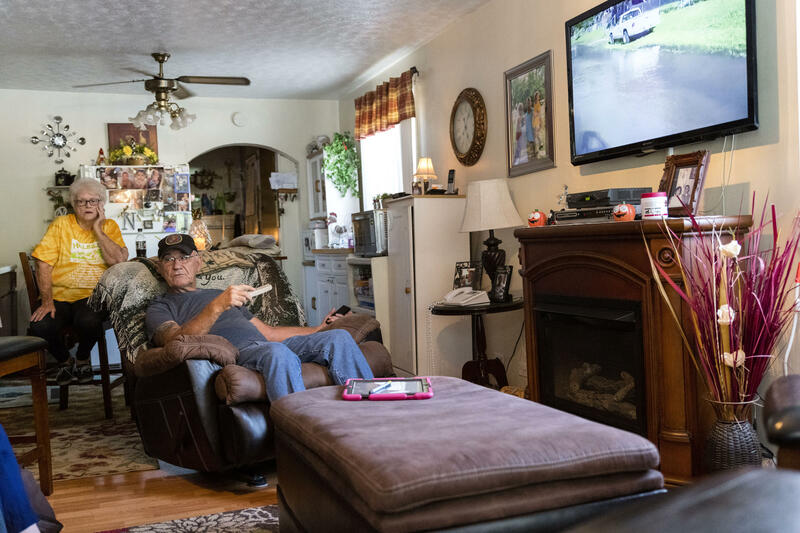 In Wyoming County and throughout Southern West Virginia, a handful of communities are on sewage systems that use “straight pipes.” Those pipes can dump raw sewage directly into rivers, including the Guyandotte, the water supply for Pineville and dozens of other towns in the region. The practice was outlawed years ago, but many straight pipes still exist in communities not connected to central sewage systems. 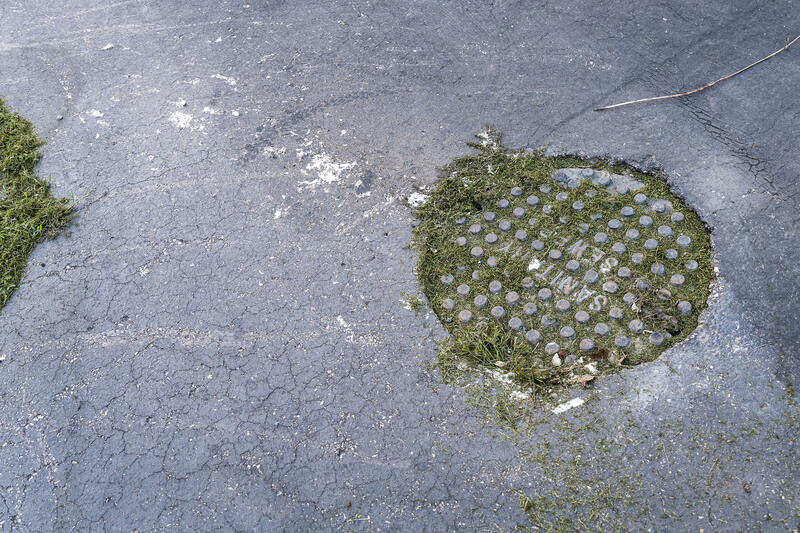 According to the West Virginia Infrastructure and Jobs Development Council, 54 percent of structures state are not connected to central sewage systems. Instead, they use septic tanks or other means of dealing with sewage, often with ill-fitting and archaic piping. According to Jacob Glance, spokesman for the West Virginia Department of Environmental Protection, local health departments are responsible for monitoring areas with straight pipes. Residents in these areas, though, are not convinced the oversight happens. In McConnell and Stollings, two unincorporated areas along the Guyandotte near the city of Logan, a series of straight pipes pump sewage into the river. The setup was meant to be temporary. It was installed after Brenda Stanley, who lives in McConnell, filed a complaint with the state Public Service Commission in 2014. Stanley said the pipe system leading to the river backs up regularly, leaving her neighborhood reeking of sewage from the murky water that pools along the road and railroad tracks. The PSC called it a health and safety concern for residents, and eventually ordered a sewage line extension through the City of Logan Sanitary Board. The project was to be complete by 2022. But as 2019 nears, Glance said, the city hasn’t secured any money for the project, and hasn’t asked for any. Stanley and William Carrere, a 79-year-old retiree who worked in plumbing and contracting after years in the mines, formed a neighborhood association to help motivate the city to act. They’ve had no luck. In the streets around Carrere’s home, exposed pipes stick out of ditches, with murky water pooling around them. Pieces of metal and plywood lay haphazardly over sewage boxes and holes where pipes, visibly mismatched in size, leak dark water at their connections. The smell is impossible to ignore. “Cover your nose, that stuff will make you sick,” a neighbor shouted, walking over to one of the pools next to a set of railroad tracks. Behind Stanley’s home, an overflowing sewage box produces that same murky water, here though, it floods a small, concrete basketball court. Walt Ivey, director of the West Virginia Office of Environmental Health Services, said raw sewage pooling in neighborhoods like this is a concern to the state Bureau of Public Health -- especially after a Hepatitis A outbreak that infected more than 1,700 individuals in the state since March. “Raw sewage has the potential to carry disease, you could get sick from handling it, and if it’s just out in the open, there are a lot of risks,” Ivey said. He echoed Glance’s sentiment -- the local health departments should be monitoring these situations. Carrere, though, said he’s never seen a representative in his community and has not been able to contact the Logan County department when things escalate. 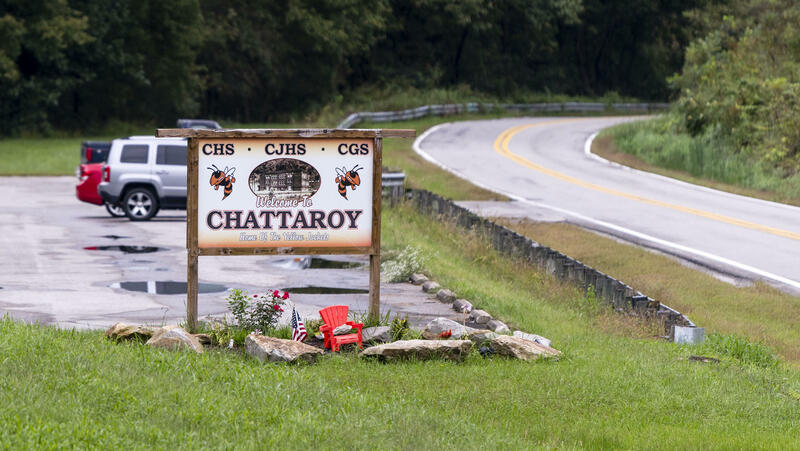 A sign greets visitors to Chattaroy, Oct. 2, 2018, in Mingo County, W.Va.
Just like Stanley, residents in Chattaroy, a small Mingo County town, know that when it starts to rain, their troubles are just beginning. Here, a group of families has been trying to fix their public sewer system for years. When it rains, two nearby manholes back up and overflow into the street, sometimes sending raw sewage, bits of toilet paper, even condoms and sanitary napkins, into the road and yards. One resident captured video after a particularly heavy rain that shows water, inches deep, rushing down the street. Megan Hatfield Montgomery is a nurse, with a husband and two kids, studying to be a nurse practitioner. She moved back to the Chattaroy neighborhood to be close to her grandfather before he died. As rain poured down one evening in August, she realized the storm would, once again, mean days without flushing toilets, taking showers or washing clothes. That happens four or five times a year, she said. During one especially bad spell in the spring, they couldn’t use their bathroom for 15 days, forcing them to temporarily move out. Montgomery, 32, said a plumber who looked under the house said he saw black mold, most likely from the water that pools there. She thinks that has caused her sons’ respiratory problems. Some days, she and other neighbors hesitate to let their kids and grandkids play in the yard or ride their bikes. Toilet paper litters the ground Oct. 2, 2018, near a manhole cover in Chattaroy, Mingo County, W.Va., out of which residents say raw sewage flows any time the area receives significant rainfall. Someone from Mingo County’s health department has visited the area “numerous times” to follow up on complaints, said Anthony Blankenship, the agency’s director. He agrees the situation is a threat to public health, but says there’s little his cash-strapped department of four people can do for a system that needs so much money and so many resources. “They’re our neighbors, they’re part our community, they’re our friends. We try to do everything we can, but sometimes your hands are tied financially [with] failing systems,” Blankenship said. J.B. Heflin, director of the Mingo County Public Service District, told the Williamson Daily News that Chattaroy’s entire sewage system, which serves about 400 customers, needs to be replaced. The system was built with 6-inch terra cotta pipes more than 50 years ago, and it would cost $6 million to do so, he said. In 2006, the situation was so dire that it caught the attention of then-Gov. Joe Manchin, who visited Chattaroy and talked with residents. This April, then-U.S. Rep. Evan Jenkins held a community meeting with residents and other officials to discuss possible solutions. Naomi and James Stollings show reporters a video on Oct. 2, 2018, of raw sewage running in the road outside their house earlier. James Stollings, 77, has heard promises and welcomed politicians before, and watched their neighbors move away in the meantime. He’s getting too old to clean his heating and cooling system after a hard rain, and he said it’s even caused him some depression. “It’s just been one problem that we can’t seem to find the right person to fix it,” he said. “Nobody knows until they go through it,” said his wife, Naomi, 76. As for Montgomery, after she finishes school, she may move out of the neighborhood entirely. This series is part of a collaborative effort by the Charleston Gazette-Mail, the Lexington Herald-Leader and West Virginia Public Broadcasting that was coordinated by The GroundTruth Project and its new initiative, Report for America, a national service program made possible in rural Appalachia with support from the Galloway Family Foundation. Read more at kentucky.com, wvgazettemail.com, wvpublic.org and thegroundtruthproject.org.